It was so quiet this morning, a level of sheer silence unheard of in Baltimore City. My wife had already left the house to go on her morning jog and I could smell the coffee downstairs she’d prepared before leaving. I got up, dressed, and went down to the kitchen for a cup, and still I couldn’t get over how quiet everything was. My wife and I rarely cross paths in the A.M. She returns from her jogs long after I’ve walked to and boarded the southbound light rail to work. I left her a note beside the coffee, as I usually do (Love ya!) and headed out the house toward the light rail stop. I passed no one on the sidewalk, and no cars passed me. I checked the date on my phone to see if today is a holiday—it isn’t. Resigned to this eerie coincidence, I continued on toward a favorite coffee shop of mine for a breakfast sandwich. The coffee shop was open but no one was inside. I waited ten minutes, and when no one appeared I continued to the light rail stop. This time in the morning there’s at least a dozen or more riders waiting for the train. Today? Only me. I bought my round trip ticket at the machine and took a seat. Opened a book and read for a while, feeling pretty damn sure no train was coming. I couldn’t focus on the book so I sent a text to my wife: Hey honey…you doing okay? It wasn’t likely she’d answer, and she didn’t. She was still on her jog. I was about to close the book and head home to wait for her to return when I heard the railroad crossing bars begin to ring their alarm bell. A train was coming! It was, after all, just some enormous, strange coincidence. I laughed at my paranoia and already had an idea or two for stories about it in mind when the train rounded the bend toward the stop. But this wasn’t the light rail. This was an old fashioned steam locomotive. It was exhaling enormous clouds of black smoke from the engine, chugging along. What a sight! Truly unreal to see something like this coming along the light rail tracks. Then it slowed. Stopped. The engine was right in front of me. I could feel the heat coming off of the steel. It was far too tall for me to see inside, and it filled me with a strong urge to run. I felt that whatever was in there, perhaps, was something I didn’t want to see. Suddenly the entire situation—the lack of people, this old-school train—made me shiver. I turned to run back home just as an object was flung from the window of the engine. It spun and fluttered toward me, slapping the pavement. Then the engine bellowed with a deafening wail and began to move once more. The cars it pulled were passenger cars and from the windows the faces of those on board turned to look at me. Each and every eye aboard the train met mine and I felt like they all stole a little piece of my soul as they passed by. She looked like my wife. I knelt and lifted the object that had been thrown from the train. 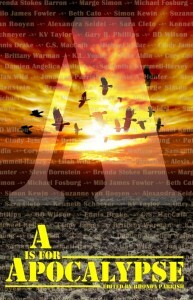 It’s a book: A is for Apocalypse. I wonder if perhaps it’s a manual of some kind? A guide to what must be our new world? I don’t know, but if you’re out there, whoever you are, reading this now, perhaps if we read it we can find a way to survive. Pick up a copy as soon as you can! Together, we can find a way to stop save all those souls on the train! A is for Apocalypse! OUT NOW in print and e-book! Featuring stories by 26 amazing authors! & stop by the Facebook release party, going on all day TODAY! Previous PostPrevious Two Story Sales!